Yay for football season! It heralds the beginning of fall. And pumpkin lattes, apple cider, root vegetables, pumpkins, and creative costumes for little trick-or-treaters. One of the best thing about football season is all the good food. These sliders are a snap to throw together and would be great any time. Maybe a baby shower or a church supper. And if you don’t consider yourself much of a cook, I bet you can still make these. Preheat oven to 350 degrees. Melt the butter and mix in mustard, minced onions, and poppy seeds together. Split the rolls and paint the butter mixture on each side of the rolls. 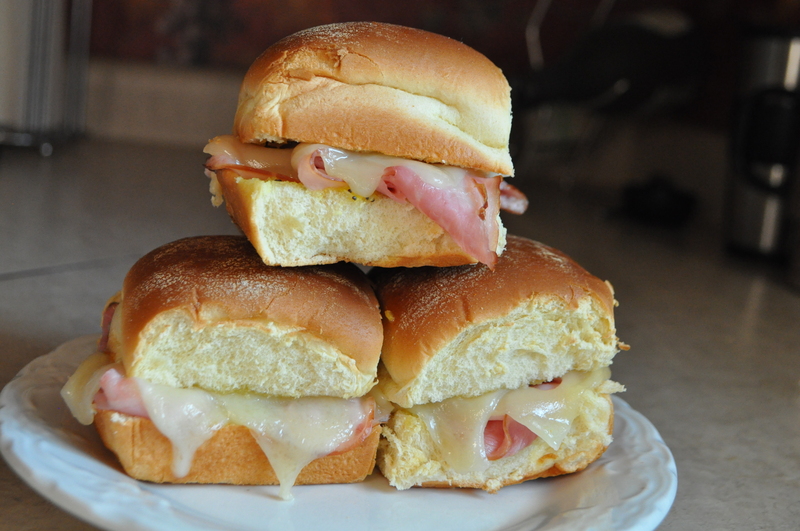 Place ham and Swiss cheese on the bottom half. Apply the top of each bun. Bake until the cheese is melted.